The Chart Chick: May We Show Off Your Genealogy Chart? May We Show Off Your Genealogy Chart? 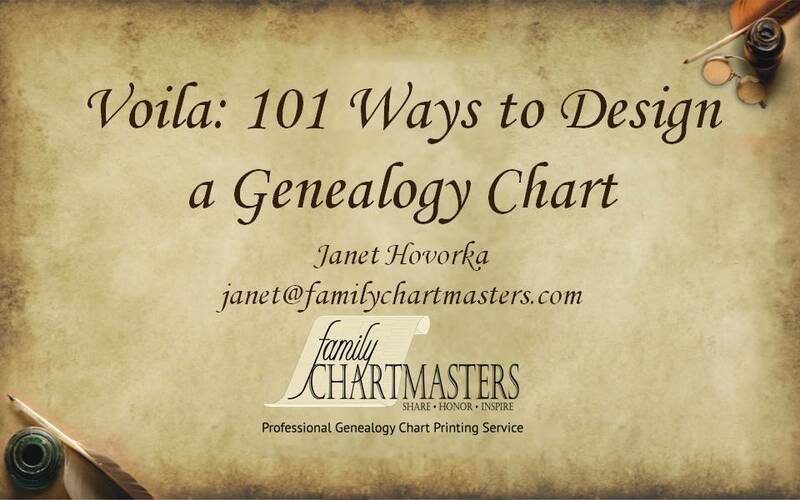 I've been asked to speak at RootsTech 2016 and the title of my lecture is "Voila: 101 Ways to Design a Pedigree Chart." After 10 years of speaking on all different topics, it's nice to feel recognized that we really know what we are talking about when it comes to genealogy charts. We've designed some magnificent charts over the years and I've always been a little bit shy about asking permission to share your chart because it's so personal--it's your family. But now I'm asking! 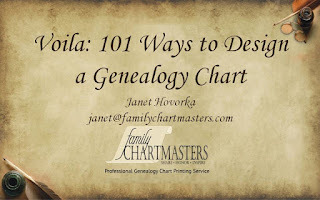 If we've done a chart for you and you would permit me to share it as part of the slideshow at my RootsTech presentation, please email me at janet@familychartmasters.com. To protect your privacy, our company policy is to always change the personal information of any living people. Sure Joan.Thanks for your interest. I will blog about it, so keep an eye out!